Set behind a deep parking lot on Sunset Boulevard and Echo Park Avenue the former Pioneer Market was a fixture of the area for many residents. But not many residents have lived here long enough to have seen Pioneer when it was one of several shops housed in brick storefronts, close to the street and sidewalk. One of these long-disappeared neighboring shops was Gross & Horn, which sold children’s clothing, toys and furniture. It stood at the northeast corner of Sunset and Logan, near Betty’s Ice Cream. I learned of Gross & Horn from a neighbor, the store’s co-owner. Over the course of about four months I sipped tea with Lois Gross, often talking about Echo Park and its history. Lois moved to Los Angeles in 1939 on the heels of a small-town scandal in Washington state. She hightailed it down to LA to live with her older sister, Helen, in Echo Park, where she was an unknown and could start her life over. The sisters were devout Christians and chose Echo Park for its proximity to the Angelus Temple and its founder, Sister Aimee Semple McPherson. Both women pooled their incomes in the early ’40s and opened Gross & Horn children’s store on a site that is now part of the Pioneer supermarket parking lot. The sisters opened two stores with their partner, Mr. Horn, and saved enough money to invest in a modest home in Elysian Heights at 2132 Valentine St. The sisters shared the home until the 1950s, when Helen married and moved to Torrance. Lois remained in Echo Park and continued to pursue her artwork, photography, and pottery. She never considered herself a feminist but she maintained an independent, self-supporting lifestyle. Lois always called herself a simple farm girl from Washington state. Her wheat investments and real estate holdings in her home state grew over the years, and once retired in the early ’70s she lived an independent, yet frugal, life. An unfortunate accident in the early ’90s left her homebound and out of touch with her community. Lois was never one for extravagances, and she lived a real pioneer’s life. When I met her, it was hard to understand how, after so many years had gone by, no one knew she was there. Lois told me of the brook that ran down Baxter to Echo Park Avenue and how fun it was to dress up for the Centennial Parade. 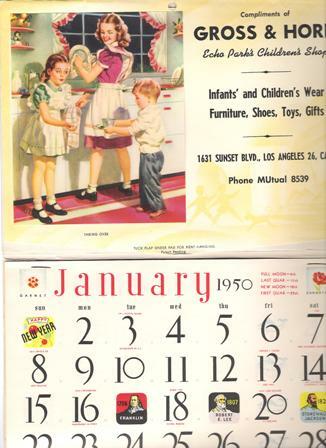 As I helped Lois clean out her house, we found posters, calendars, old newspapers, magazines and photos of the store on Sunset and of their neighbor on Sunset Boulevard, Betty’s Ice Cream. Photos showed neighbors dressed up for the centennial parade in pioneer garb. Lois lived through a lot of change as the area went through the ups and downs of urban renewal. She loved her home and the fruit trees and roses she had planted some 60 years before. Almost nothing had changed in the home since the year she moved in. A newer refrigerator was placed in front of the old one. The milk box was set for the Wednesday delivery of milk and butter. Lois hadn’t left her home in eight years when I met her. After four months of winning her trust I saw her venture out into the neighborhood for the first time. We went to Taix for dinner, and she was shocked by their prices but still glad to see the food was delicious! Lois is currently living in Kansas with her great-niece. This story appeared in the Spring 2004 issue of the EPHS News.